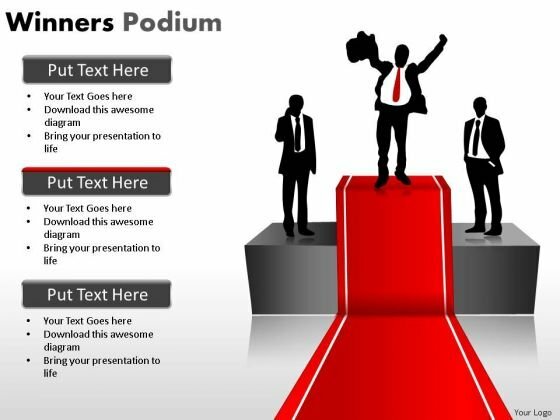 Winners podium PowerPoint templates, backgrounds Presentation slides, PPT Themes and Graphics. Download fully editable, professionally designed Winners Podium PowerPoint templates and PPT diagrams for sports presentation, racing event or business achievement presentation. Show the top 3 winners in any competitive match or the top 3 achievers in any field with podium templates. Get the golden trophy diagram as well as gold medal, silver and bronze medal diagrams for your PPT slides. Add your content in the placeholders and make changes to the color, size and orientation of the presentation template if you wish to. May the best man win!